The world has a lot of unwritten rules: In social etiquette. In baseball. And in buying computers. For years, we have unquestioningly followed numerous unwritten rules when buying a Mac. Like many customs, these rules were once based on a foundation of facts and reason. But in the past few years, many longstanding Mac truths have been upended. All Macs run on multiple-core Intel processors now. iMacs are no longer hobbled by crippling feature limitations. And speedy external peripherals have drastically lessened the need for add-on cards. In other words, the old rules no longer apply. If you’re planning on buying a new Mac, you need facts about the modern lineup—so you can choose the computer that’s right for you. In this article, we take a look at some common assumptions and explain whether they align with today’s realities. Before we begin, let’s explain some of the information you’ll find throughout this story—specifically, the score cards for each of the six Mac model lines. Each card lists a performance score and three subjective ratings. Performance Scores In addition to our standard Speedmark 5 test scores (click here to download a complete set of test data), updated for OS X 10.5.2, we’ve included Professional Applications, Multimedia, and General Productivity scores derived from the 17 tasks that make up Speedmark (these scores are relative to those of the eight-core 2.8GHz Mac Pro, which was assigned a score of 4) for each standard configuration. Our Professional Applications score comprises results from Adobe Photoshop, Compressor, and Maxon Cinema 4D. Our Multimedia score comprises results from iTunes, iMovie, iPhoto, Unreal Tournament, and HandBrake. Our General Productivity score comprises results from the Finder, Pages, Camino, and Microsoft Office 2004. 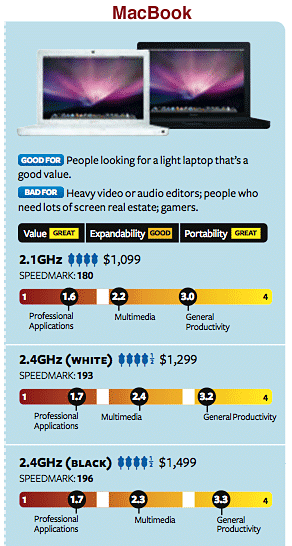 Subjective Ratings Lastly, we rated each line in terms of value, portability, and expandability on a scale of Poor, Fair, Good, and Great. For a downloadable Excel spreadsheet of product data, click here. Old Rule: I’m a power user; therefore, I need a Mac Pro. For years, Apple’s high-end Power Mac desktop systems were a great—and perhaps the only—choice for a wide variety of Mac users. Many Macworld editors, for example, would never have considered anything less when buying a new Mac. Power Macs had the fastest processor speeds and internal architectures, not to mention space for lots of RAM, hard drives, and expansion cards. Even when the iMac made its debut, it wasn’t a computer that serious power users could consider—the first iMacs offered the sort of limited power you’d find in a Mac laptop. But as the Mac entered the Intel era and the Power Mac became the Mac Pro, something interesting happened: those lower-end systems became powerful in their own right, down to the dual-core technology that was previously the provenance of the highest-end machines. There’s still a gap between high- and lower-end Macs, but now almost every Mac is suitable for general use, even by a wide swath of power users. In the meantime, Apple has started aiming the Mac Pro at a much narrower—and higher-end—group of users. Its four- and eight-core processor architectures are ideal for 3-D rendering and scientific applications. But they won’t help you build a presentation or write an e-mail message any faster. Of course, there are speed differences across Apple’s product lines. The Mac models that lack dedicated graphics processors—Mac minis, MacBooks, and MacBook Airs—offer a fraction of the 3-D performance of other Mac systems, making them unsuitable for fast action games with intensive graphics. 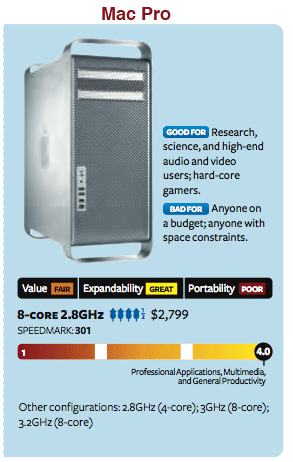 And the eight-core 2.8GHz Mac Pro ran Speedmark almost three times as fast as the slowest Intel Mac, the MacBook Air. But for most mainstay applications, the high-end iMac and MacBook Pro models are plenty fast (the 3.06GHz build-to-order iMac even beat the Mac Pro in some of our tests). Even Adobe Photoshop, a heavy-duty program that conventional wisdom has long argued should be run only on a high-end system, works acceptably well on just about any Mac (unless you’re editing gigantic files). And there are a few other reasons to consider an iMac instead of a Mac Pro: the Mac Pro is a large computer that also requires an external display, while the iMac fits into smaller spaces and requires fewer cables than the Mac Pro; and the iMac is much quieter than the Mac Pro, so people who are sensitive to noise will prefer the iMac. The New Rule: For many power users who once bought a Power Mac by default, the Mac Pro is overkill, and an iMac or a MacBook Pro is powerful enough. The Mac Pro does exist for a reason—as an option for people who need the utmost from a Mac, particularly to perform tasks that can take advantage of four or eight processor cores. If you’re performing intense scientific calculations, capturing and editing uncompressed HD video aided by the latest PCIe card, or connecting six displays to a single computer, a Mac Pro is a great choice. But if you’re buying a Mac Pro rather than an iMac purely out of pride, we offer this advice: Don’t. Old Rule: I need a Mac Pro because it’s the only expandable Mac, and I need an upgrade path. For many computer users, expandability is a little like insurance. What if you want to add a hard drive? Or a new video card? Or more RAM? Or a faster processor? If your computer is truly expandable, you can theoretically stave off obsolescence with a series of canny upgrades over its lifetime. But most people don’t really take advantage of their computers’ expandability—especially the unique form of expandability the Mac Pro offers. The Mac Pro is the only Mac with a traditional open-case design, offering easy access to internal hard drives and a panoply of expansion-card slots. But these days, you can attach most peripherals via a Mac’s USB, FireWire, and Ethernet ports—including speedy external storage devices and plug-in TV-capture hardware. It’s extremely easy to install a new hard drive in a MacBook, and installing RAM in most Macs is also quite simple. If you’re a Windows PC user switching to the Mac, you may assume that you want a Mac Pro because it’s more flexible in terms of upgrades. You can upgrade a PC’s graphics card, its hard drive, and even its processor and motherboard relatively easily. But on the Mac, those sorts of upgrades are much less common. You can’t just replace a Mac’s processor the way you can a PC’s, there aren’t as many Mac-compatible video cards out there, and Macs have never had the sort of “build your own” following that cheap PCs have. The New Rule: Unless you expect a serious need for expansion cards in the future, you don’t have to spend the extra cash on a Mac Pro. Old Rule: I need a really fast Mac so I can run Windows. Back in the PowerPC days, you needed a superfast Mac just to run Windows at painfully slow speeds via emulation software. One major benefit of Apple’s switch to Intel processors is that now you can run Windows at full speed on any Mac, via Apple’s free Boot Camp software. That said, all current Mac models can run Windows fast enough for light to medium usage. Even the MacBook Air can run Windows decently, thanks to its 2GB of RAM. The New Rule: If you spend a lot of time running Windows via virtualization software, you’ll probably want a more powerful Mac, and you’ll definitely want lots of RAM. To play complicated 3-D Windows games, you’ll need Boot Camp and a decent graphics processor—integrated graphics won’t do the trick. But if you just want to run a few standard Windows programs on your Mac, you can choose any Mac, as long as it’s got sufficient RAM. Old Rule: I’m a power user, so I need a desktop system, not a laptop. In the old days, desktops had many advantages over laptops: more power; a better performance-to-price ratio; more expansion options; and the ability to have a large display, a full-size keyboard, and a mouse. Today, Apple’s Mac mini and iMac lines use the same “portable” versions of Intel processors and RAM as Apple’s MacBook lines, so processor speed is no longer the deciding factor it was. The standard iMac configurations top out at 2.8GHz—not much faster than the higher-end MacBooks and the entry-level MacBook Pro. And both Mac mini models run slower than any MacBook or MacBook Pro (but not the MacBook Air). It’s still true that you pay more for a laptop than for a similar desktop (a 2.4GHz MacBook Pro costs $1,999, compared with $1,199 for an iMac that has the same processor speed). Although the iMacs pack a lot of complicated electrical components into a small space, the MacBooks are even smaller, and they have to be built to conserve power because they must use a battery. Cost aside, the only reason to choose a desktop Mac over a laptop is if you’re never going to want to use your Mac anywhere but where you’ve parked it. If you’ve ever wished you could take your Mac with you, whether it’s to your couch or across the globe, a laptop can give you flexibility that no desktop system can. And when you do want to work at a desk, Apple’s laptops can do that, too. The MacBook and MacBook Air can drive external displays as large as 1,920 by 1,200 pixels—so they can run one of Apple’s 23-inch Cinema Displays. The MacBook Pro is even more impressive, with the ability to power displays as large as 2,560 by 1,600 pixels—including Apple’s massive 30-inch Cinema Display. And the 17-inch MacBook Pro’s screen is so big that you might not even need to invest in an external display. The same goes for input devices and expansion options. It’s easy to connect an external keyboard and mouse via USB, or even wirelessly via Bluetooth (now standard on every Mac portable), so you can have a full desktop experi-ence with your Mac laptop. And the MacBook line’s external ports (USB, FireWire 400 on all but the MacBook Air, and FireWire 800 and ExpressCard on the MacBook Pro) can address most add-on needs, including storage and wireless data transfer. The New Rule: Unless you’re on a strict budget or you plan on using your Mac only at your desk, you can seriously consider buying a Mac laptop. Old Rule: I need a desktop Mac for serious work, and a laptop for travel. If you share your home Mac with family members, they probably won’t want you to take off with that Mac whenever you go on a business trip. But if you’re a Mac’s only user, it generally makes sense for that Mac to be a laptop. With a single system, there’s no hassle with synchronizing data back and forth between a desktop and a laptop. At your desk, you can plug in to an external monitor, keyboard, and mouse, but you’re still only a few cords away from complete portability. So is a laptop that you can take on the road powerful enough to be your one and only Mac? If you need to take your Mac with you often, especially on airplanes with small tray tables and little personal space, a scale-tipping 6.8-pound 17-inch MacBook Pro won’t be ideal. A MacBook or a MacBook Air makes for much easier transport—but it may not provide the power you need in a single system. A 15-inch MacBook Pro, which is 1.2 pounds lighter and less deep and wide than its 17-inch sibling, can be a good compromise between power and portability. The New Rule: Mac laptops are fast and flexible. If you need more power than a laptop can provide, or if your desktop Mac serves more than one person, a two-Mac solution might be a better bet. 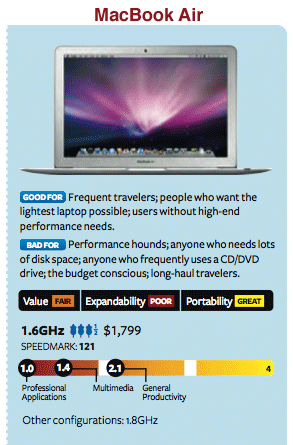 Old Rule: Macs are just as expensive as they’ve always been if you want good performance. If you’re like some of us, each of your Mac purchases has caused a financial dent of about $2,500. That’s because a midrange professional tower was, for a long time, the sweet spot when it came to a powerful Mac you could count on. Thankfully, those days are gone. 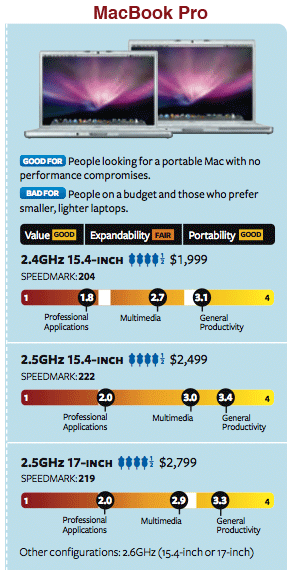 A 20-inch 2.4GHz iMac costs $1,199, and it’s as fast as or faster than most Power Macs you might be upgrading from. People who are considering leaving the Windows world, who often assume that the tower-shaped Mac is the only choice for them, no longer need to fear that high prices will be an insurmountable barrier to buying a Mac. The New Rule: Although prices for Apple’s various models have stayed roughly the same over time, the performance of lower-priced systems has improved dramatically. But it’s not just that you get more Mac for your money than ever before—it’s also that the differences between the various Mac lines have diminished. If you still need all the power Apple has to offer, however, you probably won’t see any savings now. A quad-core Mac Pro—the least robust of the bunch—will run you $2,299, whereas the slowest eight-core system starts at $2,799. Old Rule: I need a large, nonglossy display for video and photo work.